The courage and sacrifice of Nisei servicemen in World War II is well-known among Japanese Americans. Along with the mass incarceration of West Coast Nikkei during that same period, it’s probably the most famous and defining part of our history. Their story, though, has largely been told in broad strokes. It goes something like this: At a time when America questioned their loyalty and locked up their families, the Japanese American soldiers of the 442nd fought so valiantly, they became the most decorated unit in our country’s history. It’s a good story and a true story, but it’s not the whole story. When we try to seek out more detail, we often look at specific numbers of people in specific battles. But we’ve largely kept the messy, emotional, and contradictory stuff at a polite distance. One question, in particular, has gone largely unaddressed: What was it like for the Nisei to fight against the people of their ancestral homeland? It’s easy to see why this doesn’t get discussed much. The question implies that the Nisei had some attachment to Japan and the Japanese people, and since their loyalty was under suspicion, it’s understandable the Nisei don’t talk much about their feelings on the issue. In fact, the Nisei aren’t really known for talking much about feelings in general. However, the feelings of Nisei soldiers is really what “MIS: Human Secret Weapon,” the new documentary from Junichi Suzuki, is all about. And it focuses on one group of Japanese Americans whose feelings about Japan were particularly complicated: those in the Military Intelligence Service (MIS). The secret U.S. Army linguists comprised of 6,000 mostly Nikkei men, who served as translators throughout the war and occupation. 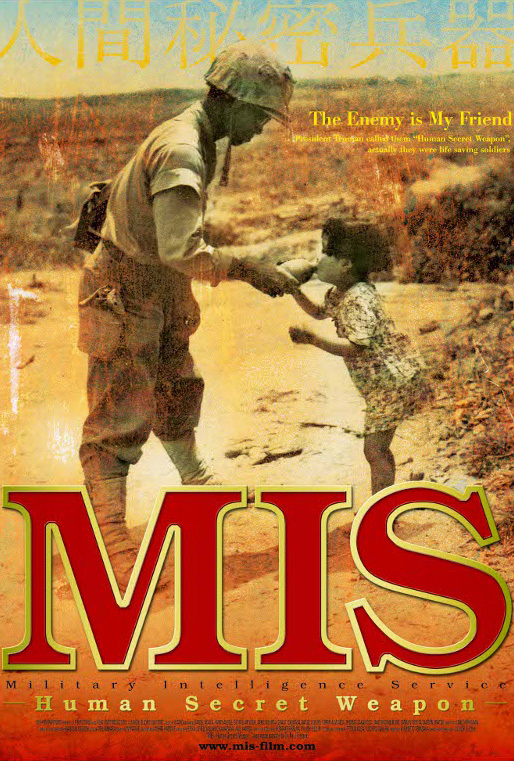 Giving just enough dates, locations and history to keep the story in context, “MIS: Human Secret Weapon” tells firsthand the personal stories of the diverse set of men who made up the MIS; from their recruitment and training in San Francisco’s Presidio, to their role in the occupation of Japan. “Human Secret Weapon” is unafraid to take small digressions here and there, and while some of them seem out of place — for instance a section about the tragic natural disasters that befell northern Japan in 2011 — others add invaluable insight. There is a break from the typical talking-head documentary format, in which MIS veteran GEORGE FUJIMORI is telling a story and his son-in-law, Richard Hawkins, interrupts him when he uses the term “American” to refer to Caucasians but not to himself, thus pointing out how tragic it is that even all these years later, the terminology Fujimori uses suggests the racism he grew up with is still deeply internalized. Another section hints at some of the fascinating moral dilemmas the occupation posed for the MIS, as their mission included spying on private civilian correspondences and combating the spread of domestic communism in Japan. What’s most remarkable about this film though, is the candor the filmmaker gets from the veterans. War is difficult for everyone, and throughout history, many soldiers have dehumanized the enemy as a coping mechanism. For Japanese Americans in the Pacific Theater during World War II, this was more difficult. And the interviews in “Human Secret Weapon” show just how hard it was for the MIS in particular. The interviewees, who include 442nd veteran and U.S. Sen. DANIEL INOUYE; MIS veteran NORMAN MINETA, who previously served on Presidential Cabinets; and 442nd veteran and executive director of the Japanese American Veterans Association, Terry Shima, had direct contact with Japanese soldiers. They interrogated them, read their letters, and in some instances, given that many MIS soldiers were Kibei (Nisei who studied in Japan and returned to the U.S.), they even knew Japanese soldiers personally. The filmmaker manages to get the veterans to explain in-depth what this felt like, revealing a unique aspect of the MIS soldiers’ sacrifice. “Human Secret Weapon” is a great film for all audiences, but for Japanese Americans, it’s something more. Generally, when I review films, I try to keep my personal life out of the writing. But in this instance, I think my personal life is not only relevant, it would be dishonest not to bring it in. My grandfather (who died long before I was born) was in the MIS; with the recent awarding of the Congressional Gold Medal to the Nikkei World War II veterans, I’ve been thinking a lot about what his experience might have been like. I have plenty of Nisei friends and relatives, many of whom served in World War II themselves. I’ve seen them be warm and supportive in some instances, and stoic and serious in others. But I haven’t seen them be open and vulnerable. Nisei men cry when they relate their wartime stories. Their voices tremble. And they describe feeling sadness, fear, horror and regret. Seeing this kind of vulnerability in them was completely heart-wrenching. I feel like I’ve gained a glimpse of something I always knew was there, but had been kept firmly under lock and key. While this is my own personal experience, and others’ are undoubtedly very different, I believe many Japanese Americans will feel the same way. The time to collect these stories is fast running out, and so I believe that what “MIS: Human Secret Weapon” has done by capturing them on video is a great service to our community.